Women always care about their appearance. Most of them spend their money on waxing kits, trimmers, and safety razors with the aim of removing their facial hair. 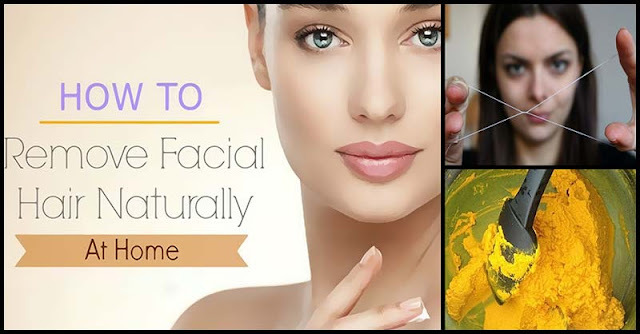 If you are one of those women who is giving up, sick, and tired of shaving or waxing your face then, there are natural ingredients that are proven and tested when it comes to removing ingrown facial hair, getting rid of mustache or trimming those whiskers. These remedies will protect you from unwanted irritation of the face, and also the hair won’t grow up faster. The use of turmeric is a painless method of removing unwanted hair. This magical spice will help you loosen unwanted facial hair without any pain. The result might not come overnight however turmeric will gradually and permanently help with hair reduction. How Is It Done And Applied? Create a creamy paste by mixing turmeric powder with water. Just make sure it will not dribble. Apply the mask on your skin and allow it to act for 20 minutes. Since ancient times, sugar and lemon treatment has been used in Egypt and other European countries. This treatment is less painful, more natural, and more economical as compared to regular waxing. 1. Poor a small pot with lemon juice and 2 teaspoons of sugar. The juice should cover the sugar, but if you do not have enough juice, add a little water. 2. Heat the mixture on medium heat until. Stir it using a wooden spoon until the sugar dissolves completely. 3. Using a thermometer, wait until the mixture reaches 115 degrees Celsius. 4. When the liquid begins to boil, reduce the fire and wait for it to form a thick, sticky paste, but manageable, soft golden color, like honey. Turn aside from the heat and let it cool down. You burned the mixture and you must make a new one if there is a dark color, you burned the mixture and you must make a new one again. Use this mixture as a wax. Clean first your skin and apply a small amount of cornstarch on the place you need to remove hair from in order to prevent the mixture from sticking to your skin, thus reducing irritation. Apply the mixture to the critical area and do not wait for the mixture to be stuffy, but immediately pull in the opposite direction of hair growth. Apply a moisturizing cream or aloe vera gel after you are finish waxing. Wash your skin with warm water if some wax remains on the area. Also known as threading, this technique has a very good effect. It has been the most economical way or removing facial hair by just using a thread. For this method, you’ll be needing a silk or cotton thread as a tie for holding the follicles of the hair roots with no irritating action on the skin. What’s great about this technique is that after six weeks the hair will gradually weaken and disappear.